people in East End and he was enjoying giving back to his home community. recognized each other from as far back as 1955. It would sure be nice to attend another Grand Reunion! It's winter, and some of my old Newport News High School buddies are getting restless. 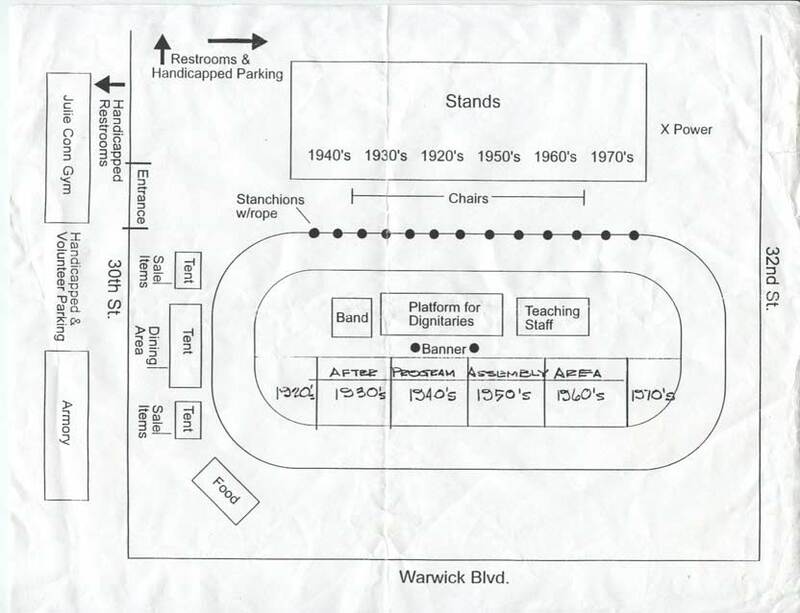 So they've stirred up a Grand Reunion to be held at the old athletic field, called Saunders Stadium, on April 14, after the sun comes out for spring. I got notice of the grand occasion from Richard McMurran, one of the organizers, and I've put it on my calendar. We ``Typhoon'' kids are supposed to immerse ourselves in fellowship from 2 to 5 p.m. that day if the weather is good. If not, the proceedings will be delayed until April 28. 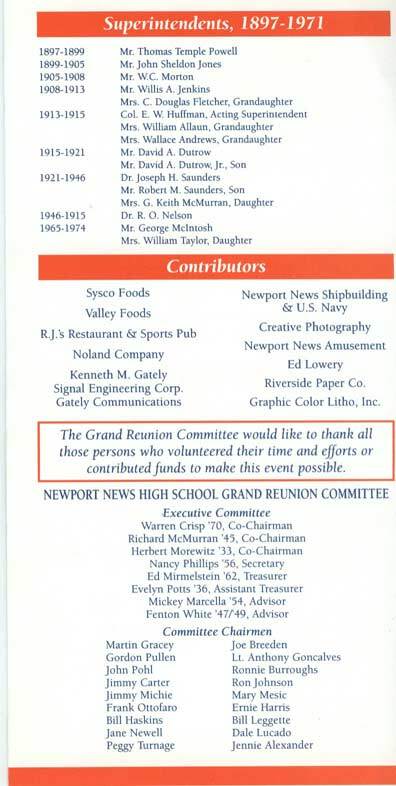 This is the second schoolwide reunion to be planned for us aging enthusiasts since NNHS closed in 1971 and became a naval barracks. Since then no high school in Newport News has been singled out to bear the city's name; school officials feel that would seem to favor one school over the three or four other high schools now in the city, and I think they're probably right. High school wasn't my finest hour, but there I formed friendships for a lifetime. I wasn't a football star like Bobby Spangler or Horse Hallett or Bird Hooper, but I met a lot of fine people, and I found out that writing was to be a most enjoyable career. I also learned at NNHS that God hadn't meant me to be a violinist. 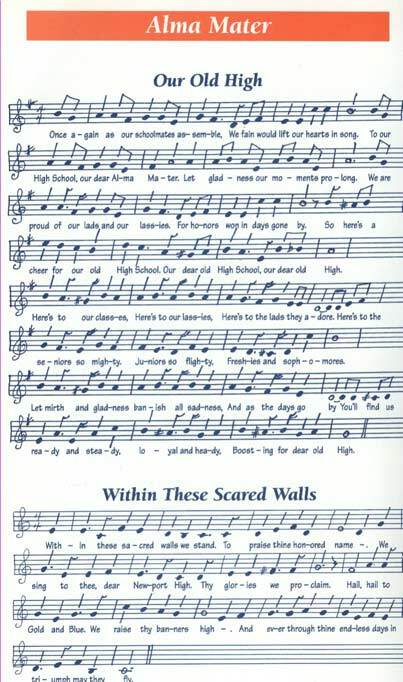 When I entered NNHS in February 1930, most of us Depression kids regarded attending high school as a privilege. A lot of NNHS students had to work afternoons or Saturdays to get through. Only about a fifth of us took pre-college courses; most of the men would go on to the Apprentice School at Newport News Shipbuilding, and the girls would become stenographers or saleswomen. Newport News was a middle-income town, and its schools had their share of earnest teachers and pupils. Our motto was ``Ad astra per aspera,'' which meant ``To the stars through hope.'' Principal Fred Alexander's recurrent theme in Monday morning assemblies was ``Live up to your potentialities.'' It reminds me of the Army's recruiting slogan ``Be all you can be.'' That's what public schools are for. 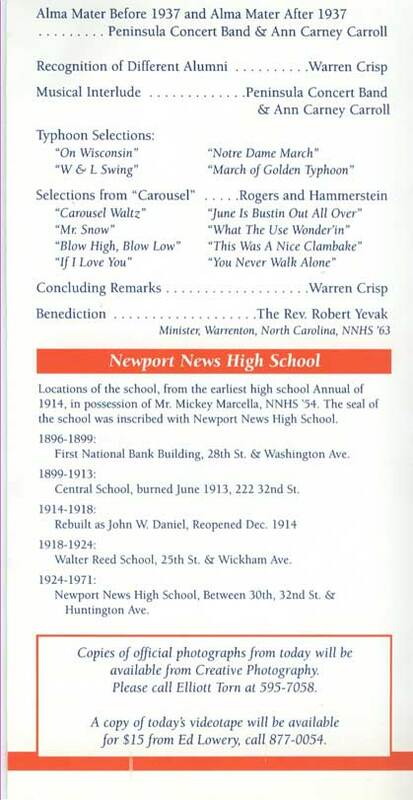 The first Newport News High School opened exactly 100 years ago, in 1896. It was housed in the new First National Bank building at 28th Street and Washington Avenue. Its principal was Professor Horace Hardaway Epes, formerly of Blackstone (and the maternal grandfather of Richard McMurran, happily enough). There was an assistant principal and a dozen or so students, nearly all girls. The first class graduated one student, while the second, in 1897, had six. One graduate was Maud Via, who became Mrs. Lewis Littlepage and was the mother of Mrs. Gibson Allen of Williamsburg and the aunt of Guy Via Jr. Another was the late Mrs. Thomas R. Belch. Graduation ceremonies were held each June at the Academy of Music on Washington Avenue. In 1899 high school students attended classes at Central School at 32nd Street and Washington Avenue, later renamed John W. Daniel School. After World War I, when Newport News' population climbed to more than 35,000, separate high schools for white and black students were built. The school for white students, NNHS, was opened in 1924 at 31st Street and Huntington Avenue, and Huntington High School, for black students, was built at 18th Street and Marshall Avenue. Both were good schools. 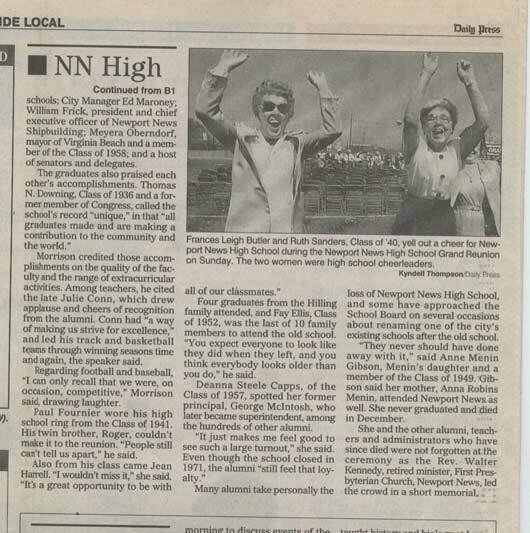 When I entered NNHS in 1930, it was a coed institution of about 1,000 students, most of them from downtown and East End. We had good teachers, most of them women, and three good administrators: Principal Alexander, assistant principal Lamar Stanley and dean of girls Ethel Gildersleeve. After my day, it had as principals Lamar Stanley, George McIntosh, Robert Maidment, William Etheridge, John Caywood and John Kilpatrick. Assistants were Mary Scott Howison, S.D. Green, Thomas Keesee, Ethel Gildersleeve, Margaret Lane and John Kilpatrick. Deans of girls before Miss Gildersleeve were Miss Howison, Mary Wynne Jones and Dorothy Crane. 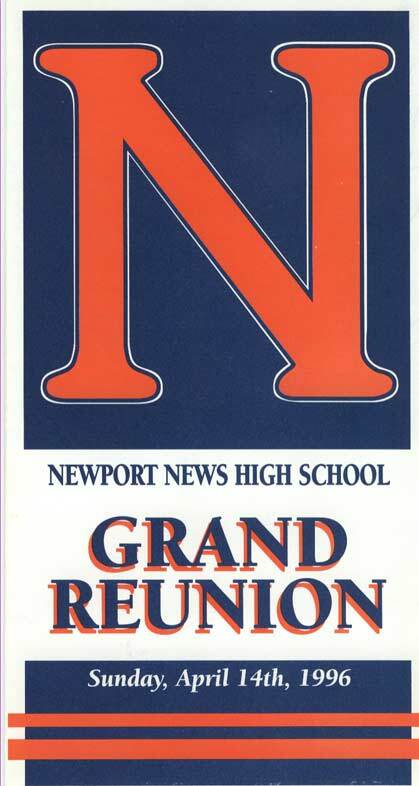 Every student and teacher who graced NNHS from its opening in 1896 to its closing in 1971 is invited to the April reunion. So are any surviving principals, assistant principals or deans of girls. The ever-active Richard McMurran has also compiled a list of all faculty members. Alas, all those whom I knew have died, for I was graduated way back in 1934. If this reunion is anything like the last one, it will attract crowds beyond belief. We public school kids have a real love for that well-run alma mater, which taught us to ``live up to our potentialities.'' In our cynical age, it convinced me that public education can be a fine thing if parents and students really want to make it so. "Oh, Wisconsin" midi courtesy of http://www.50states.com/songs/wisconsin.htm.